JERUSALEM – Archaeologists digging on Jerusalem‘s Mount of Olives have discovered a nearly 3,000-year-old jar handle bearing ancient Hebrew script, a find significantly older than most inscribed artifacts unearthed in the ancient city, an archaeologist said. The Iron Age handle is inscribed with the Hebrew name Menachem, which was the name of an Israelite king and is still common among Jews. The inscription also includes a partly intact letter, the Hebrew character “lamed,” meaning “to.” That suggests the jar was a gift to someone named Menachem, said Ron Beeri, who directed the excavation for the Israel Antiquities Authority. There is no indication the inscription refers to the king himself. 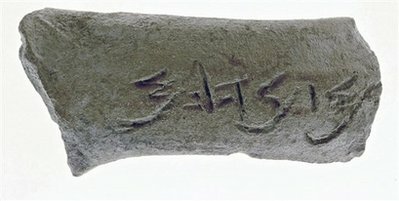 The name and similar variants have been found on Egyptian pottery dating back 3,500 years, and the Bible lists Menachem Ben Gadi as an ancient king of Israel. But this is the first time an artifact bearing the name has been unearthed in Jerusalem, Beeri said. Menachem is normally spelled as “Menahem” in English versions of the Bible, such as the NKJV. 17 In the thirty-ninth year of Azariah king of Judah, Menahem the son of Gadi became king over Israel, and reigned ten years in Samaria. 18 And he did evil in the sight of the LORD; he did not depart all his days from the sins of Jeroboam the son of Nebat, who had made Israel sin (2 Kings 15:17-18). But even though he was evil, Menahem is now being used to provide additional confirmation of the Old Testament. This entry was posted on Thursday, May 21st, 2009 at 11:58 am	and is filed under Old Testament History. Jehoash Inscription: More Biblical Evidence? TW: Archaeology validates the Bible–again!